It's Friday. I can't focus. It's a gorgeous day. Perfect for a lunchtime tea adventure. 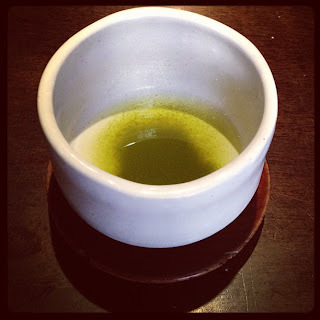 Cha-An, a popular Japanese tea house has been high on my list of places to visit. It felt like the perfect time, so I pounced. Through an unassuming door and up a flight of stairs is a smart little room with dark wood and delicate Japanese flourishes. When I arrived it was early and quiet. There is a bar with a view of the kitchen for a quick bite (and sip), but I chose a table in order to relax a bit more. The service is sweet and friendly. As you can imagine, the tea selection is inviting with a focus on Japanese greens. The menu is helpful, giving the country of origin for each tea, as well as the body. There is a tea to suit just about every mood. Today I was looking for something that packed a bit of punch, so I chose the Makinohara Sencha for it's assertive vegetal flavor. The tea arrived quickly and was poured from a kyusu. The pot was the perfect size, with just enough water for one large cup. Served in this way the tea didn't continue to steep and get bitter. I like this attention to detail. When my cup was drained, the pot was promptly refilled with water. This tea was exactly what I wanted. Bitter, with a vibrant vegetal flavor. Refreshing and invigorating. It paired well with the smoked salmon and sweets that came with my meal. Regarding food, it is prepared with focus and care. Everything is dainty, and I felt a bit clumsy while I ate. But it's all very tasty, especially the sweets. The scones I had were quite buttery and delicious. They even had little bits of tea in them, which added a subtle floral note. I was so full that I had to take some of my sweets to go, which made for a cheerful afternoon snack. Cha-An is a perfect place for Japanese style afternoon tea, or to relax with a bowl of Matcha. They also offer special events including tea ceremonies. It gets a bit loud during lunchtime, but I imagine it is quite peaceful during the off hours. The perfect place for a lunchtime respite. It is definitely a sanctuary in the midst of the brunch craziness of E. Village. I hope to return soon, too! There is this Art Gallery Yakimono in Paris, showing nice pieces.